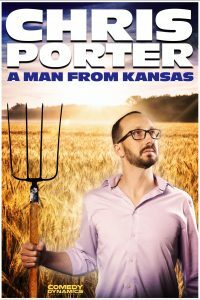 Comedy Dynamics announced that it will release Chris Porter’s new stand up comedy special titled Chris Porter: A Man From Kansas, A Comedy Dynamics Original. The special will be released on April 16, 2019 on the Comedy Dynamics Network via iTunes, Amazon, Google, PlayStation, and XBOX, along with many major telco & satellite providers, including Comcast, DirecTV, Spectrum, AT&T, Dish, and Cox Communications. Comedy Dynamics announced that it will release Chris Porter’s new stand up comedy special titled Chris Porter: A Man From Kansas, A Comedy Dynamics Original. The special will be released on April 16, 2019, on the Comedy Dynamics Network via iTunes, Amazon, Google, PlayStation, and XBOX, along with many major telco & satellite providers, including Comcast, DirecTV, Spectrum, AT&T, Dish, and Cox Communications. Best known for his 3rd place appearance on season 4 of NBC’s Last Comic Standing and his one-hour special ‘Ugly & Angry’ that was one of Netflix’s top-rated specials for three years, you may also know this Kansas City native from his very own Comedy Central Presents special, his comedy albums ‘Lost & Alone’ and ‘Screaming From the Cosmos’, his appearances on Tommy Chong’s Comedy @ 420 on Showtime, the Arsenio Hall show, Comedy.TV, or your favorite local comedy club. Born and raised in Kansas City, Chris brings a true stand-up experience to his live shows. There are no sound cues, no puppets, and no catch phrases. Just gut wrenching laughter drawn from his own experience and observations. “When a lot of people think of Kansas, they think of the Wizard Of Oz. This comedy special will not change that. I mean, how am I supposed to complete with psychedelic imagery and flying monkeys?! But this is definitely funnier than Wizard of Oz.” said Chris Porter. “Chris’ relatable style of observational comedy is on full display in his hilarious new special,” said Brian Volk-Weiss, CEO of Comedy Dynamics.